Author/s : Ram Singh 1 and A. B. Mandal 2. / Central Avian Research Institute, Izatnagar, Uttar Pradesh 243 122 India. Efficacy of fumaric and citric acids in preventing biosynthesis of aflatoxins in poultry feed with variable moisture content is an original research work carried out in my laboratory for safe storage of animal feed. Aspergillus spp. are primarily storage fungi and are found virtually everywhere in the world that produce aflatoxins (B1, B2, G1 and G2) in feeds. 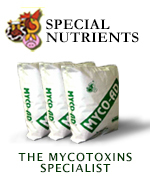 Therefore, achieving complete inhibition of aflatoxin-producing fungus during storage of feed is of utmost importance. This study was conducted with the aim of establishing the efficacy of fumaric and citric acids as mould growth inhibitor in poultry feed. Love to receive more insight on this work. Reducing moisture below 13% is very important to decrease feed safety cost. How to make storage low moisture and avoid moisture loss? Would you like to discuss about this topic: Efficacy of fumaric and citric acids in preventing biosynthesis of aflatoxins in poultry feed with variable moisture content?